Authors Note: Big K is my personal non-fiction essay of growing up alongside the rise and fall of a local department store; remembering its affluence. 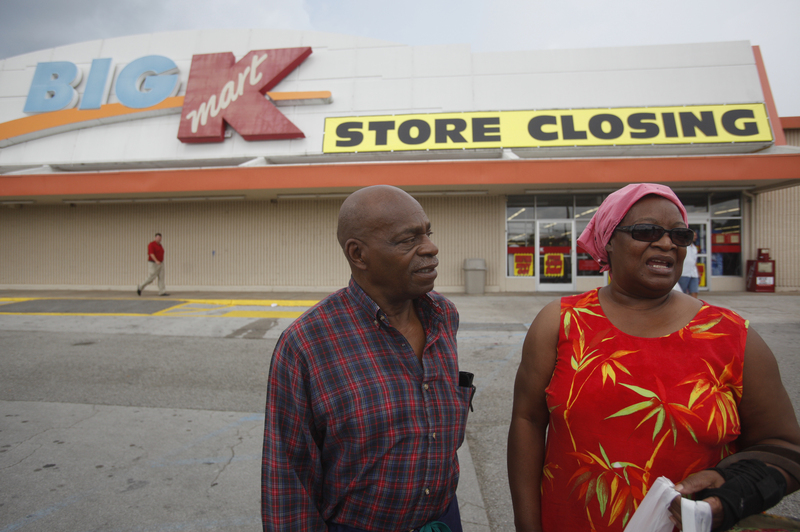 Picture of my Kmart published in local paper. It’s a strange thing to have so vivid a place fixed in the space betwixt your ears, and to realize its real-life counterpart is no more. Having seceded to economic reality and a lack of consumer confidence, the department store chain “Kmart” is all but forgotten nowadays in my home town. Oh, but to the children of its time, the Kmart was the place to kill all manner of time for those who lived upon the 58 Hwy stretch. I, as a 58’er from age 6 to 21, can remember each aisle and the contents they held in. Now, it’s an empty building, the aisles striped bare, and cold save the debris of what was left when the Kmart went out of business two years ago. And Alive, the Kmart held no magic exceptional except what a child’s eyes might preserve. The Kmart had three long long aisles FULL of toys. These aisles were in the back corner of the store, far into the heart of the Kmart, and here the lights were dimmer. Everything else so bright. There was an aisle for girl toys AND an aisle for boy toys and still a BONUS aisle for miscellaneous toys like coloring books and board games…things parents might consider toys while we children knew better. The girls toy aisle was superior. Obviously. The boys had to share their shelf space with the baby toys (soft dolls, bright keyed pianos), but we girls, we had an aisle unto ourselves. Who knew they made so many different Barbies before Kmart showed me the possibilities? Strategy had to be devised to try and rescue these bright faced dolls from their home among the others and to my own home. I would casually show the newest one of the week to my mother, insinuating in the show that I was merely educating her on the doll selection. I’d wait for her side-eye glance of acknowledgement as she tried valiantly to shop with us three young terrors she called progeny taking turns running the length of the store, swinging on her shopping cart, and presenting our problems of starvation and defecation needs to her every half hour. If her response to my new Barbie 101 presentation was cool and distant, I knew I’d face the long walk from the grocery aisle back to the toy haven, but if she gave me more (a word or even a lapse in judgement to hold the bright plastic doll box herself) I knew my walk of shame would not be for today and the doll had a chance of slipping into the basket. I would hold my breath for the Judge’s decision and if the box tipped into our buggy, still I would follow the cart the rest of the shopping trip, carefully resting my hand along the metal bars and starting and the wide-eyed doll eyes within. In this gaze, I willed Barbie to be silent and remain in the cart until we could insure her freedom beyond the register. There was more to Kmart than the toys (and the toy vending machines beyond the register); much more. Each aisle had something to entertain. There was always something begging me to stop and consider. There were rows and rows of glistening strands of “diamond” jewelry; bath mats with smiling frogs upon them; sneakers with glitter built into their sides; bags upon bags of novelty candy; a Tetris maze of tennis rackets, baseball bats, and balls; and the very latest selection of Lisa Frank folders with Dalmatians and Polar Bears upon them. The store had everything you wanted. Kmart was there in every season. There were purchase opportunities at my every growth milestone. Back to school in September and there would be a selection of backpacks in teal, pink, army camo, and more to choose from. We were children of the upper middle class. We did not carry the same backpack for multiple school years. Completing a year of school guaranteed us new school supplies in August. Our parents knew the contract. Soon after school started, the garden center area vanished overnight and in its place were rows of costumery, rubber spiders and rats, and the candy we waited all year for. We would buy face paint and props from these aisles, but never costumes. We had pride. We would spin our own identity from gold string out of Mother’s sewing kit and aluminium foil shaped into swords and crowns. We plucked valentine card boxes for classmates from these self same seasonal aisles. We bought at least four backyard pools from these aisles. But there were all just warm-up acts to the show the Kmart put on for Christmas. The whole store was transformed. Christmas gold and shiny red and green foil covered everything. Trees were for sale, blow-up Snoopy riding his doghouse, and ornaments, of course. The things of fantasy and dreams were all on sale at Kmart. Everyone’s presents came from Kmart. Our Christmas might as well have been sponsored by the Big K.
One year, we shopped on Christmas eve as the store was overrun. I found a plastic squeeze ball with no price and chipped paint. The cashier told me just to take it home. I didn’t understand that frantic look in her eyes until my own retail years. As we grew up, Kmart shifted its weight. The pizza parlour where my brother tried to swing upon their line bar and lost two baby teeth in the process, disappeared one day and was replaced with plus size wear. The lingerie department where I bought my first bra in the 5th grade (a B cup overnight, thanks genetics) all but ceased to be under the weight of a strong push of pajamas and sleepwear. The toy aisles grew darker and more populated with red-stickered discounted toys as the call of the CD, DVD and electronics department across the way beckoned. The magic of finding something new, unthought of, and unknown until then, faded as well. One day I looked up and found myself in the deodorant aisle with only time, money and interest enough to ward off BO; no time to explore the mystery I’d found in those aisles once before. The frequency of this occurrence increased until I found myself hitting Kmart only in desperate need. Wal-Mart had more selection, after all, and a string of unrequited high school crushes ate up all my attentions. I could see the glow of the big “K” from my job at the grocery store across the street. We wasted time after work by tipping grocery carts and throwing hand baskets on the roof of our workplace, and the gentle influence of Kmart watching our actions grew quiet and dim. I had a license now, and the 58 Hwy could no contain me or my purchasing needs. The Christmas Parade started at the K Mart parking lot and went the length of 58 until breaking up at the former $1 cinema. The parade disappeared one year and no one really noticed until January. K Mart shut its doors only a few years later. They sold everything at 70% off in the last week. The shelves had been cleared in hungry animalistic ways by deal predators. I didn’t remember any of this until this year I gazed into the red, green, orange, blue, pink lights of my lit Christmas tree, and found a quarter of the lights unlit because of one dud bulb. This entry was posted in Uncategorized and tagged Barbie, Christmas, Holidays, Kmart, Nostalgia, PersonalEssay, Wal-Mart by Erica. Bookmark the permalink. Don’t forget the ICEE machine that used to dispense delicious, half-frozen liquid cherry goodness like a magical fountain that materealized childhood dreams!